So I've come to the conclusion that waffles and whipped cream were meant to be together. Just typing that is making my mouth water. Oh, my. We made these amazing waffles last night and they. Do people say "killer" anymore? Yeah, I usually don't say it much either, but these. Oh, these just are. Whoever thought to pair maple and pumpkin together is an absolute genius. Those two elements together just scream fall and marry perfectly visually and in your mouth. DO NOT SKIP THE WHIPPED CREAM. You would be committing a serious, and I do mean, serious error! 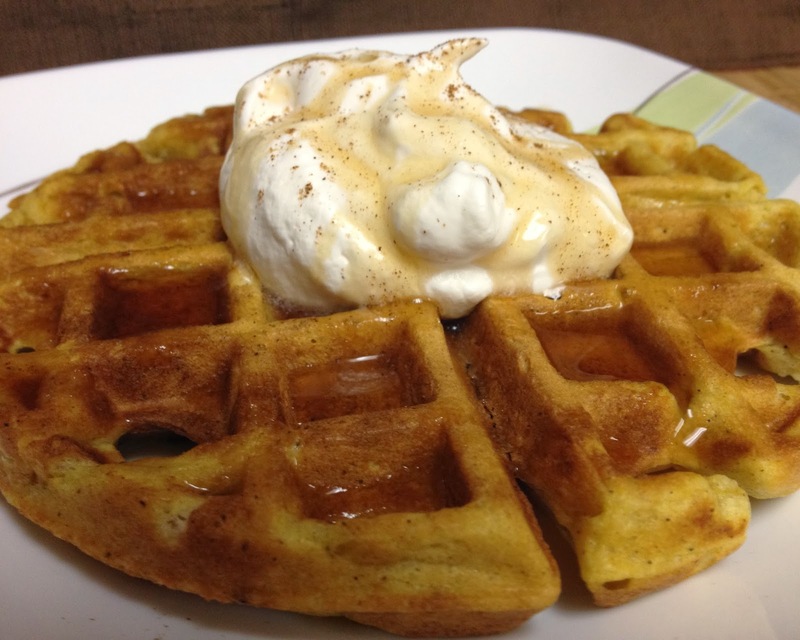 The real whipped cream laced with maple just takes these amazingly spicy and pumpkiny (yes, I just invented that, spell check) waffles to a whole new level. And you don't want to miss out on the ride. Oh, and just for the record, bacon LOOOOVES hanging out with maple and pumpkin. Lightly grease a waffle maker with some nonstick spray and preheat it according to the manufacturer's directions. In a bowl, whisk together baking mix and pumpkin pie spice. Make a well in the center of the flour mixture. In another bowl, combine milk, pumpkin, vanilla, butter, oil and egg. Whisk until smooth. Add to flour mixture and stir until just combined (a few lumps are ok). Add 3/4-1 cup batter to the waffle maker and close lid. Cook according to the manufacturer's directions. Remove waffle with a fork and keep warm while repeating with remaining batter. Make the whipped cream: in a chilled bowl with stand mixer or handheld mixer, beat cream with syrup until soft peaks form. 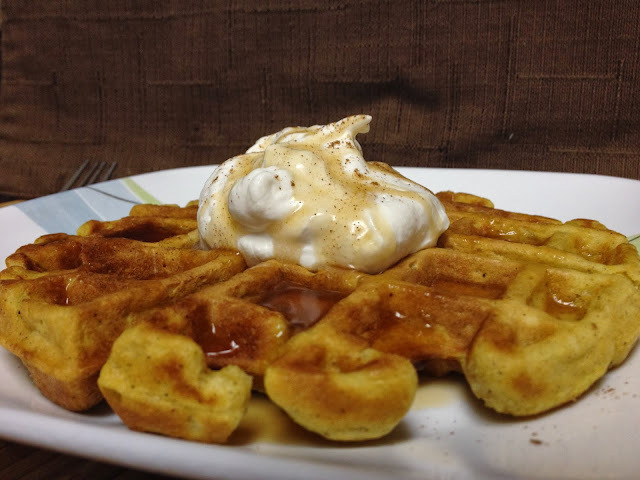 Serve with warm waffles and more syrup if desired. I put maple syrup in some cream cheese frosting for some cinnamon rolls a few weeks ago and I seriously think that it was the best frosting I've ever made. Life changing!